A dental bridge can be a solution if you are missing one or two teeth. While a bridge will not replace a tooth root, it will fill the gap and help your smile look more attractive while providing support for neighboring teeth so they don't move out of place. If you have missing teeth that you are interested in replacing, please call Medford cosmetic dentist Dr. Ryan Clancy today at 781-396-8558 to schedule your consultation. A dental bridge consists of an artificial tooth, called a "pontic," affixed to two dental crowns which are placed over the teeth adjacent to the missing tooth or teeth. The two crowns provide strength so that the artificial tooth can be used normally for biting, chewing, and speaking. Traditional: Dental crowns are placed over adjacent teeth and used to hold the false tooth in place. Cantilever: Used when there is only one natural tooth available to support the artificial tooth. Cantilever bridges are rarely used since they can't provide the same kind of strength as a traditional bridge. Maryland: Also known as a resin bonded bridge, a Maryland bridge is a more conservative solution for missing teeth that are not subject to strong biting force. Maryland bridges use a framework bonded to the adjacent teeth to keep the artificial tooth in place. The plus side is that your teeth will not need to be prepped for crowns, but the downside is that the resin bonding is not as strong. Traditional dental bridges are the most common type, since they can provide the best strength and stability. Dental bridges can last for ten years or more with proper care. Bridges may also be partially covered by insurance, which is a benefit for some patients. However, a bridge cannot prevent the jaw bone from shrinking since it does not replace the tooth root. The only type of dental restoration that actually replaces the tooth root is a dental implant. 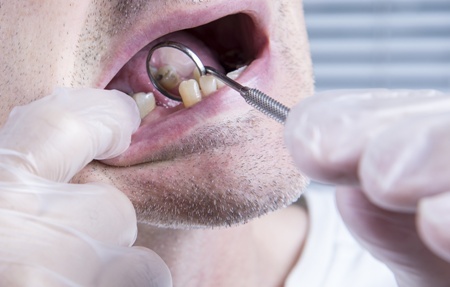 If you are missing one or two teeth, you may be a candidate for a dental bridge. However, if you are missing a large number of teeth, you may be a better candidate for dentures or implant-supported dentures. Dr. Clancy will examine you and let you know what your options are during your consultation. If you have tooth decay or gum disease, these issues should be treated before you undergo a dental bridge placement. A healthy mouth is necessary to support a bridge, and good oral hygiene habits are key to maintaining a bridge once placed. Dental bridges require no special care, but you should maintain good oral hygiene and make sure to visit Dr. Clancy twice a year for regular checkups and deep cleanings. Although you cannot floss between the crowns supporting the artificial tooth, you should still floss everywhere else. You may want to look into a water flossing tool in order to reach the areas you can't floss with string. You should also avoid eating too many hard foods such as hard candy or granola, and avoid sticky foods such as toffee as well. These types of foods can lead to needing premature bridge replacement. If you are interested in a dental bridge, don't hesitate to contact Dr. Clancy at 781-396-8558 to schedule your consultation. We serve patients in the greater Boston area, including Medford, Cambridge, Somerville, and Winchester.